As we celebrate Father's Day this month, I'd like to focus on the father-daughter bond which until relatively recently had been neglected in favor of exploring the father-son relationship. 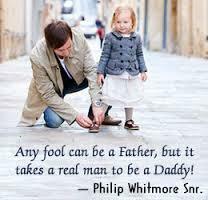 In fact, the father determines much of his daughter's future attitudes toward both love and work. Because he walks the narrow line between affection and seduction, the father's task to parent may be especially difficult and complex. One to whom we can be eternally grateful is Anne Frank's father, Otto Frank, who discovered the diary she had written while hiding with her family in an attic in the Netherlands for two years during the Nazi invasion. Anne and her father were very close. She loved her father dearly and wrote often of their affectionate relationship. "I must say, I was very much surprised by the deep thoughts Anne had. It was quite a different Anne I had known as my daughter...And my conclusion is, since I had been in very good terms with Anne, that most parents don't know really their children." From this reflection, we can garner wisdom. In spite of years of proximity, parents and children share a characteristic of every other interpersonal relationship, the aspect of the unknowable. Fathers can't entirely know their daughters, regardless of how responsible, sensitive and attentive they are. So how should they proceed? The answer is both simple in its dictum and highly intricate in its execution: to parent with an open and curious mind while homing in on a child's attributes and avoiding negative criticism.